I have been asked to write about Starbucks. Oh this shall be fun! This follows many conversations on Twitter both with local people who dare go in there, and also fellow coffee geeks. I am forever slagging off the place, despairing of my friends who go in there and refusing to name the place inside my cafe. But I am always asked WHY? What’s wrong with Starbucks? Well, actually, nothing particularly obvious. I read Joseph Michelli’s “The Starbucks Experience” a while ago. I was quite rude about it on here, and embarrassingly, he actually found this blog and responded. What I didn’t like about the book was just it’s gushing, unquestioning praise for the company. There was virtually no criticism at all in the entire book. Toe-curling. Far more interesting is the fact that you can read at least two-thirds of the book without realising it is about a coffee shop. Michelli is an expert in business and marketing, and in this respect, you can’t fault Starbucks. They have ‘turned the ordinary into the extraordinary’ as Michelli puts it, or, to the cynic, (moi?) – convinced otherwise sensible people that parting with £3 for a cup of coffee is not only justifiable, it is a lifestyle, a fashion statement and a small luxury we can treat ourselves to in a socially acceptable manner. They have even cornered the market of non-coffee drinkers by building an empire based on serving huge milkshakes with a coffee theme, to people wary of the strong black stuff. “The lactification of coffee” as someone else says (“Cite your sources Bel!” “Ketchup, mayonnaise, and HP…” –get to the point…) has made for an undeniably successful business venture. Anyway, declaring their coffee shops as ‘the third place’ – by which they mean, not at home, not at work but somewhere in between, and a social meeting place that is far more respectable than a pub – means they have managed to entice people in, even if they are not visiting for the coffee itself. Michelli writes about how the company tries to fit in with the local community and so on; a global brand trying to operate its individual branches on a local level. Starbucks has therefore ingratiated itself almost as a social ‘need’, I would suggest in the lack of other public meeting places. As a business model, you can’t fault it. 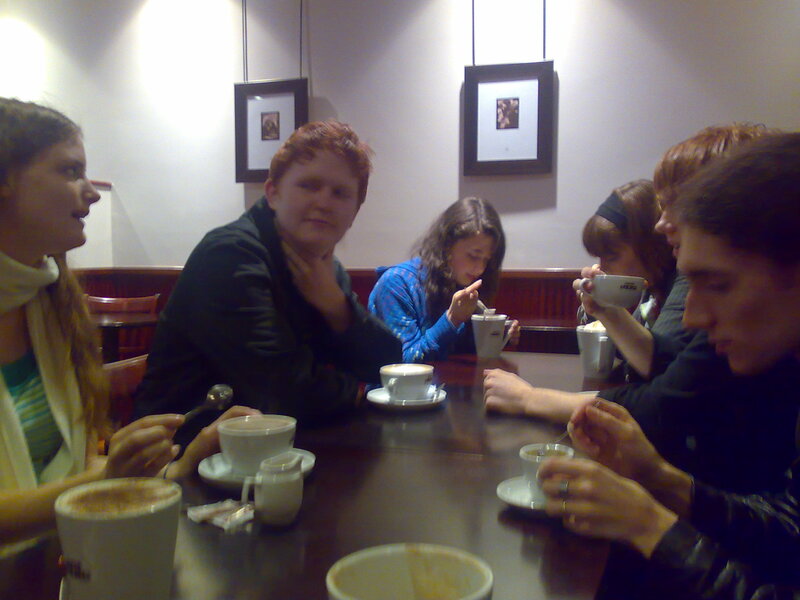 Where did people ‘hang out’ or meet up before coffee shops? Teenagers have been inhabiting them since the 1950s espresso bars because they were refused entry to pubs, but otherwise I assume the equivalent would have been youth clubs or dancehalls or maybe just playgrounds or something. None of which really exist any more. Do we really have to replace them with a branded, corporate empire of identical shops? But I could just as easily argue, that without Starbucks paving the way and making coffee shops popular social spaces, the likes of my business and of smaller, excellent independent coffee shops would not exist. So, thank you Starbucks for getting the British to drink coffee. Now sod off so I can make it properly!! Michelli also praises their customer service. I can only assume that things are different in the USA, because over here, the customer service is not terrible by any means, it’s just not particularly good or memorable. Serving customers is brand-specific; I encountered the same thing working at Caffe Nero. They train you how to serve, if not actually scripting it, then certainly suggesting things to say to your customer – the 6 service steps which all begin with S so that you remember them, and the ‘mystery customers’ sent by the area manager to check employees are doing it right. The effect is like talking to a robot, and from the opposite perspective, it gives the barista very little scope for injecting any personality or individuality into the transaction. I run a coffee shop, I serve the same range of drinks as Starbucks and Nero, I promote the place as a social meeting place and I have free wifi so people can bring laptops and work in here. But the BIG difference is, I get to be Me. It’s my business, it is very small and obviously independent of any chain branding, and so a huge proportion of my success or failure depends on my own personality. In this sort of job and at this level of business development, I am still selling myself as much as I am selling coffee. That gives me the advantage of being unique, and it is not something that big brands can ever emulate. I admit, I do not like the idea of social space being restricted to branded corporations, neither do I like the generic chain coffee shop feel. However, my biggest criticism of Starbucks is the coffee they actually serve you. There is no polite or academic way of saying this – Starbucks Coffee Is Terrible. 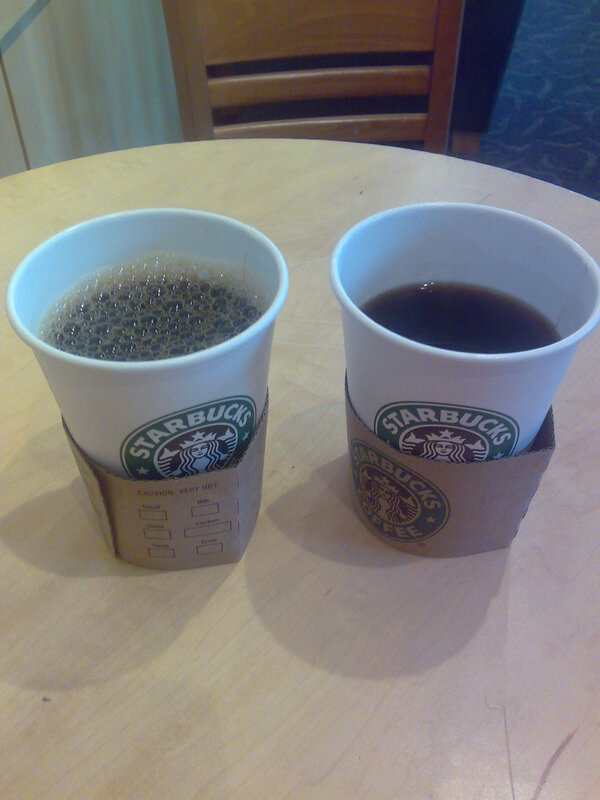 This is partially a personal preference thing I know, and as mentioned earlier, Starbucks have been very good at persuading non-coffee drinkers to drink it by making coffee drinks that don’t actually taste of coffee. A Starbucks ‘venti’ mocha, for instance, is 614 calories if you have it with full fat milk, and comprises of 3oz of House Blend espresso, 2oz chocolate syrup, 15oz hot milk, topped with squirty cream and chocolate sprinkles, thus rendering the coffee pretty much obsolete, drowned in dairy and sugar. I am fairly sure that would set you back over £3 too. Back to the ubiquity though: Starbucks’ house blend has to taste exactly the same in January in Darlington as it does in July in Detroit. It is part of the brand, it can’t from place to place or season to season. But coffee is incredibly variable. Stuff that grows in Costa Rica doesn’t taste the same year on year anyway, and coffee from Indonesia won’t taste the same at all. Using a blend of coffees helps keep the taste consistent to some extent, but Starbucks has a trick to make sure. They actually bake the coffee – roasting it slower at a lower temperature than it would normally require. This helps to bake out the variation in flavour, gets rid of the subtle nuances of individual batches of coffee, to form a bland, generic taste that can be reproduced consistently, year round on an enormous scale. It is also why Starbucks coffee is a.) burnt, b.) rarely served as a single espresso c.) cheap for the company and d.) so bland as to be inoffensive to the majority of latte drinkers. Ugh Ugh Ugh Ugh Ugh. Starbucks have had a lot of muck slung at them in recent years. Starbucks always seems to be at the centre of the anti-globalisation protests, where the small minority of rioters smash its windows and the Daily Mail get lots of dramatic photos and condemn the violent thugs and miss the point entirely…but I disgree. It is usually targeted because to many, it is a symbol of corporate America, the faceless global monopoly (more or less). That and being charged so much for such bad coffee is sometimes enough to spark all sorts of angst. Actually, their ethics, or lack of them, are no different to the majority of very large companies. But that is not to say they are a highly moral, outstandingly responsible, considerate company, far from it! 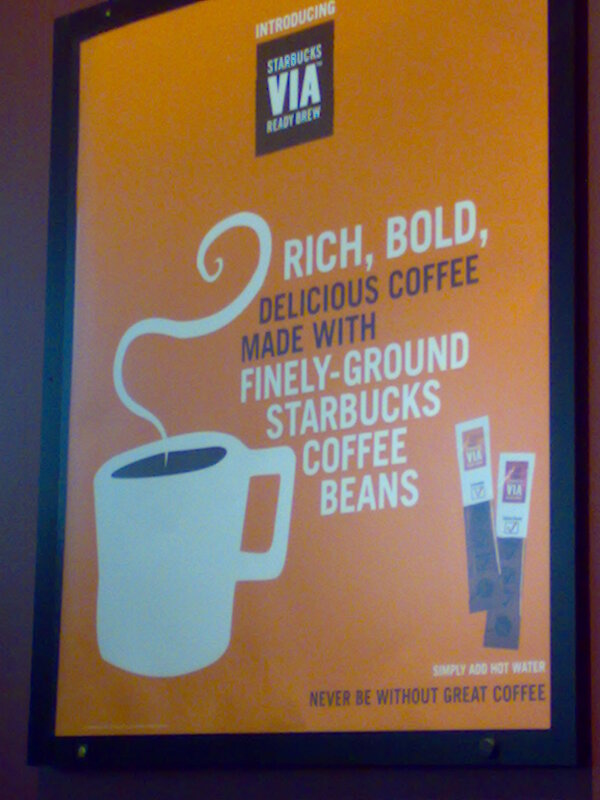 In January 2010, Starbucks UK switched its House Blend coffee to Fairtrade. This received a lot of praise – at last, they are being ethical! Fair prices for the farmer! Harriet Lamb of the Fairtrade Foundation says she was delighted about the swap. However, cynics may have noticed the global price of coffee on the New York Commodity Exchange. In the past few years, the global commodity price has soared, and this year it reached at 35 year high of over $3 per pound, whilst the Fairtrade minimum has remained at $1.31 per pound. It was only very recently that the Fairtrade Foundation changed their regulations to state that coffee buyers must pay the Fairtrade rate OR the market rate, whichever is higher. 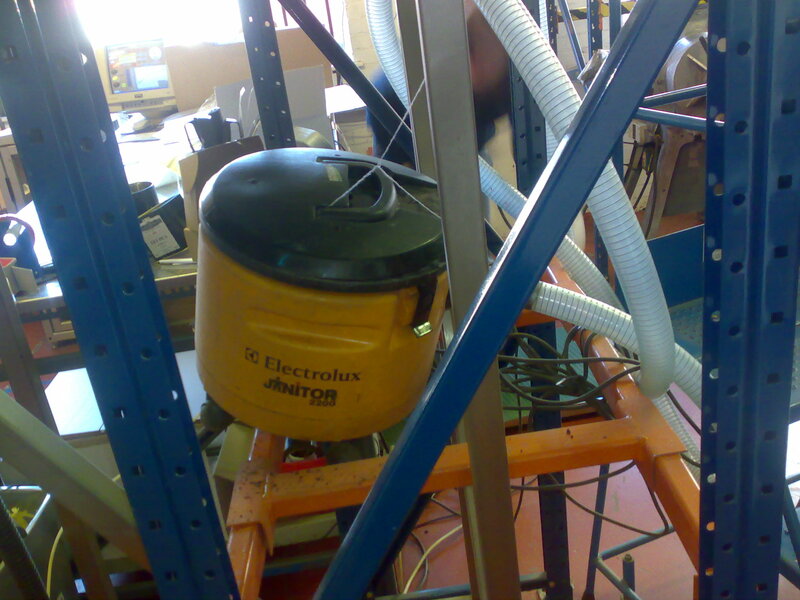 Until that point, with careful negotiation (easy enough when the company is that big!) Starbucks could have switched to Fairtrade entirely because it was cheaper than buying on the open markets. The fact that being 100% Fairtrade just sounds so good and gives you kudos with the consumer is just a bonus. So, unethical trading, terrible, burnt coffee, buckets of hot milkshake for rip off prices, robotic customer service, and the very fact that you are never more than ten minutes away from one – those are the reasons I am not a fan of Starbucks, dear reader. Please, if you love real coffee, check out your nearest independent place, support local businesses and don’t buy coffee themed milkshakes from people wearing those ominous green aprons. Please.